Ancient Stones - Lothian - 004 Standing Stone, Standingstone, East Linton. This fine and sturdy specimen can be found in the stackyard/orchard at Standingstone farm to the south of Traprain Law near East Linton. At 2.80m high and averaging 0.64m on each side this stone is substantial and solid. Another standing stone, known as The Loth Stone, can be seen towards Traprain Law, set along the field boundary. From East Linton take a minor road for Traprain, continue south for Sunnyside, go straight on then right and through Luggate. Standingstone Farm is the next set of buildings on the road. Ask at the house for permission to park in the farm yard and for access. 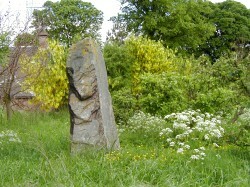 Another standing stone in the "East Lothian" group that surrounds Traprain Law. This is a good, solid stone situated in the orchard of Standing stone Farm, to the south west of East Linton. Access and parking is easy but please call into the house and ask permission first. Looking at the image now, I wonder if the south east face of the stone is in alignment with 015 The Loth Stone towards Traprain law, or rather its original position? Perhaps even the hill itself. A task for another visit to the area!